The Ayopaya province was one of the first departments created in Cochabamba and is also one of the largest and most remote. The area abounds on many varieties of potato like the delicious Morochata potato. Chirimoyas, paltas, guayabas and other fruits and vegetables sprout up in the orchards and farms of Ayopaya as well. The village of Villa Indepencia, capital of the municipality, got its name because of the participation of its people in the War of Independency. There are still colonial houses, its people are mestizos and Quechua, and the Río Palca is passing by the village. The saint festivity of Independencia is on July 16th, in honor of La Virgen del Carmen which is celebrated with prayers, parades, competitions of sports and motorcycle events, and a bullfight. People come from the cities and the countryside to share the festivities. There are some tourist routes to take advantage of the town around. 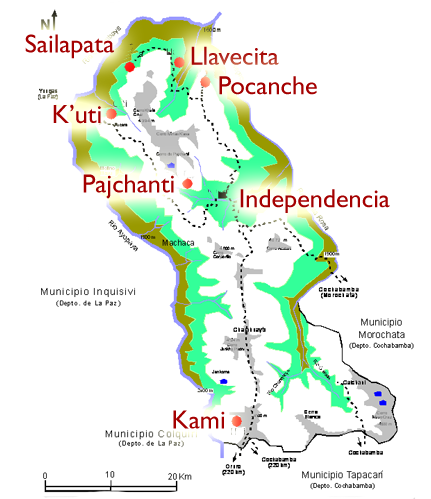 The natural reserve of 284 hectare of cloud forest in Phajchanti, consists of the "Mountain Pine" species, and is the biggest reserve of its kind in Bolivia. There is also a lake and a cascade of surprising landscape and of difficult access that challenges adventurous tourists. From the summit, you can observe the town of Independencia. Their houses are built of materials of the place, and there are typical foods as the T'impu (lamb with rice). Their party is in carnival. It is a community of easy access and big natural and cultural values. The mine of Cerro Sapo is one of only four Sodalita mines in the world, but it is the most important one. You can visit the mine and see the exploitation and the refining of that blue precious stone. The mine is located in the village of Sivingani, where find beautiful landscapes and cloud forest. Due to their amount of native forest, there are cascades and rivers of crystalline waters. Among their fauna you can appreciate Andean fox, puma, parrots, infinity of birds, vipers and others. Among their historical patrimony their are ruins of prehispanic period (graves, caves and tunnels). The rural families even conserve knowledge of ancestral and typical customs as preparing of typical food (the Huchu), stories, and legends. Llavecita is one of the most atractive communities that has much to offer to its visitors. The Picacho tombs close to the village of Llavecita are an archaeological place that gathers a group of eight chullpas of mud with triangular doors of 1 meter of altitude and 0.8 meter in the base; all directed to the East. They are funeral monuments (mausoleums) made by ancient habitants. The Sacambaya Wall is one of the important archaeological remains of the municipality. It is 166 long and 4 metres high and it is located at the bottom of an impressive canyon of surrounded by legends of hidden treasures. During the time of the Republic these constructions served as asylum for legendary guerillas (José Miguel de Lanza and José Miguel de Chinchilla among others). A hypothesis on the origin of these ruins saysthat this ruins could have been built in a pre-inca period and they were possibly used and amplified by the Inca. 2nd Sunday in May: This fair that takes place at the square "6 de Agosto", exposes the variety of fruits that people cultivate in the region. In the eve, there is a serenade with local groups and dance. On sunday morning you can enjoy the ambrosia (local drink made of fresh cow milk and grape liquor) and later starts the fruit exposition. Each farmer has its own place to expose and sell its products, and at the end the Mayor's office gives a award to the farmer with the biggest fruit. 6th of June: This religious festivity takes place at the main square of the village of Machaca. There are prayers and procession in Machaca. Famous is the statue of "El Señor de Machaca", which shows Jesus as a black. 16th of July: This festivity takes place at the square "6 de Agosto". The "Virgen del Carmen", the patron saint of Independencia, is honored by a week full of activities and festivities. A lot of people return from the city to be with their relatives and friends and to participate in the big entrance of folkloric and autochthonous dances. Among all the traditional activities in this festivity, it consists of a fair of handicraft, autochthonous and folkloric dances, a bullfight, processions and prayes. 25th of July: This religious festivity takes place in the villages of Carhuani, Llavecita, Sivingani, Pocanche and Piñamayu. This celebration is celebrated in honor of the horses. There is a horse race held, dances and folkloric music. 15th of August: This religious festivity takes place in the village of Tapaza. This festivity is in honor of the Virgen del Asunción, masses are held, processions and a dance entrance. There are godfathers for folkloric groups as well as caporales and tinkus. 1st week of September: This event is carried out in the village of Huallikiani. This bulls fight is an amusing activity to participate and watch. The location is Huallikiani, about 30 minutes in car from of Independencia along the road towards Sivingani. 8th of October: This festivity takes place in the village of Tiquirpaya. This festivity is celebrated with the dances, prayers and typical processions in honor of its patron saint. 8th of November: This important date for the whole municipality, it is celebrated the anniversary of the Villa de la Independencia. The celebration is accompanied by parades, exhibitions and a serenade. In the eve of the anniversary, local bands play in the square of "6 de Agosto". On November 8th, the students and authorities give speeches alternating with life music in the main square after parading along the main street. 1st of December: This event takes place in Molle Pampa. It is an opportunity for the farmers to expose their cattle. Authorities come from Cochabamba to judge and to give awards to the best cattles. In the morning you can enjoy ambrosia (local drink made of fresh cow milk and grape liquor) and later the exhibition of the animals, and a speeches of the mayor and the authorities. 2nd December: This fair is carried out the village school of Ch'arahuaytu. This date marks a proud day for the artisans of the municipality. It is their opportunity to expose and sell their work.